Big news coming out of the Su Lab today! As you may know, we’ve been doing a lot of work recently on the presentation of our datasets stored in BioGPS. After we completed the ability to easily browse and view datasets, we wanted to take it a step further and make it possible organize, simplify, explore and alter the presentation of the data. 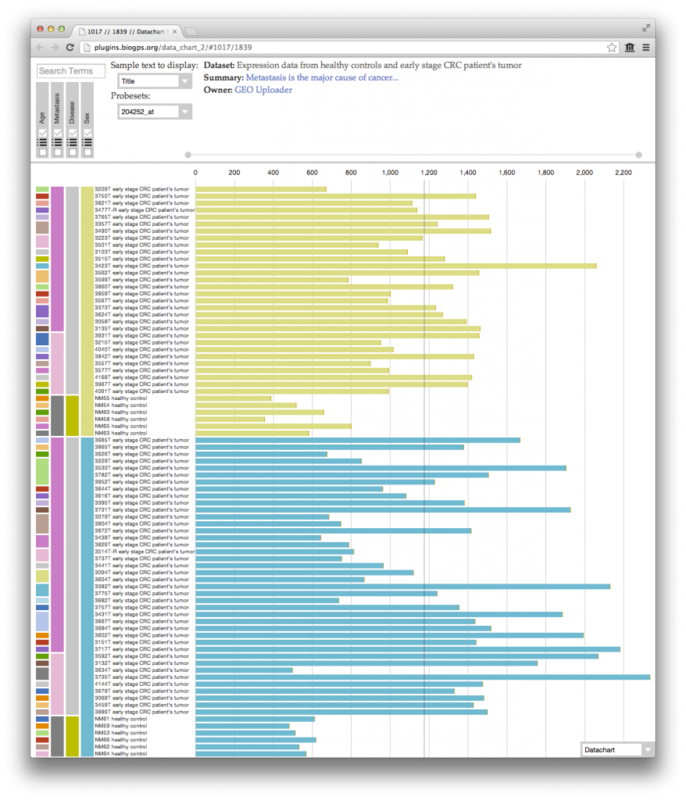 Our current data chart plugin was updated over the summer and that got us thinking about how to improve and aid insightful discoveries. 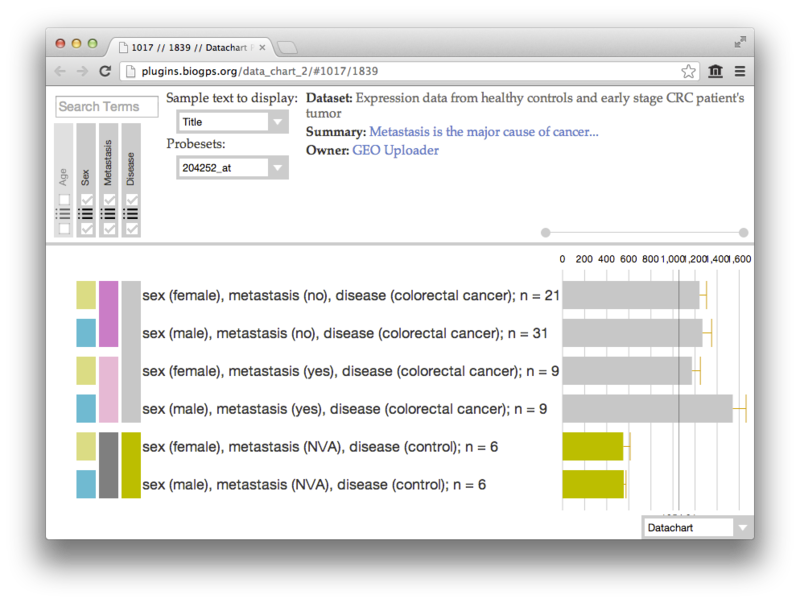 We wanted to be able to easily load up a dataset to view, and just explore. If a dataset has factors, how do they looked aggregated, how about aggregated on multiple factors while still allowing us to order them any way we please? Modifying the visualization should let you to decide how you want to display the data for your own use. To make this change, we started from the ground up. 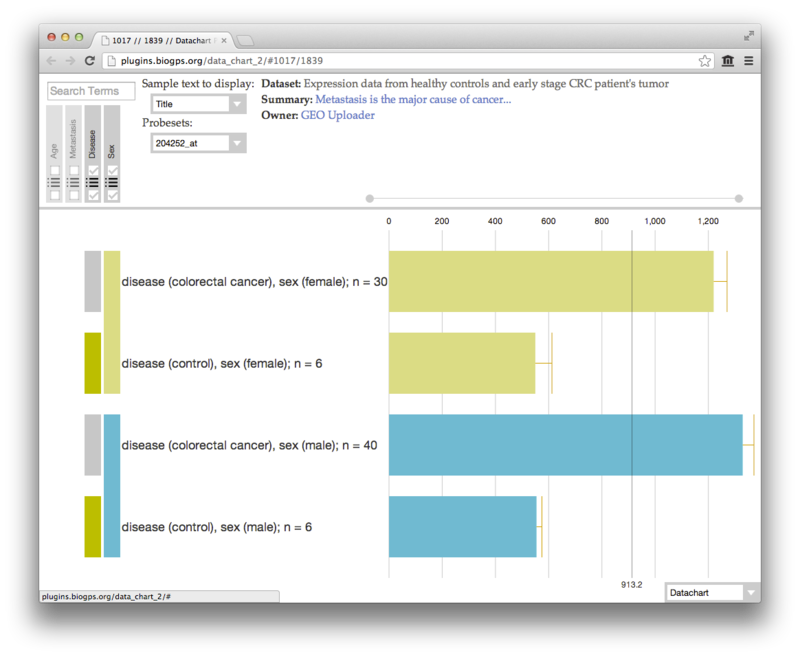 Today we’re releasing an entirely rebuilt Data Chart plugin in beta mode. 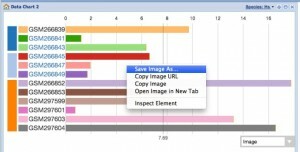 This new plugin has all of the same features of the previous Data Chart plugin in addition to a wealth of new features. The aim of this beta release is to introduce the new chart to everyone so we can start to get feedback on the user experience behavior and features. 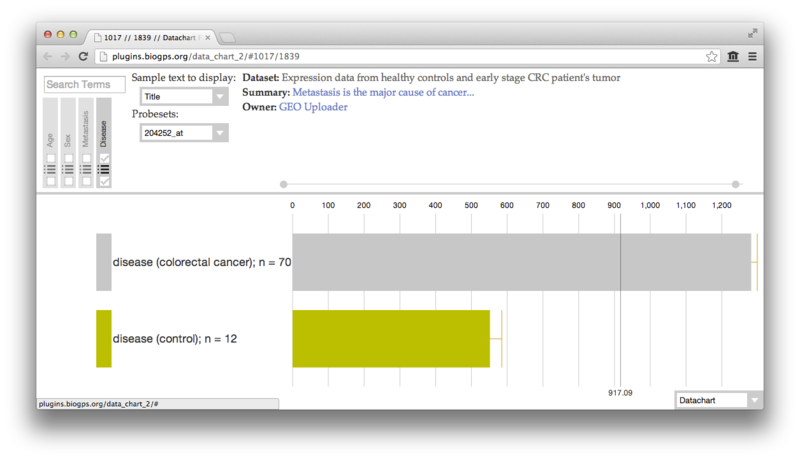 We can now easily see that the metastatic state is not correlated to CDK2 expression with our diseased samples. 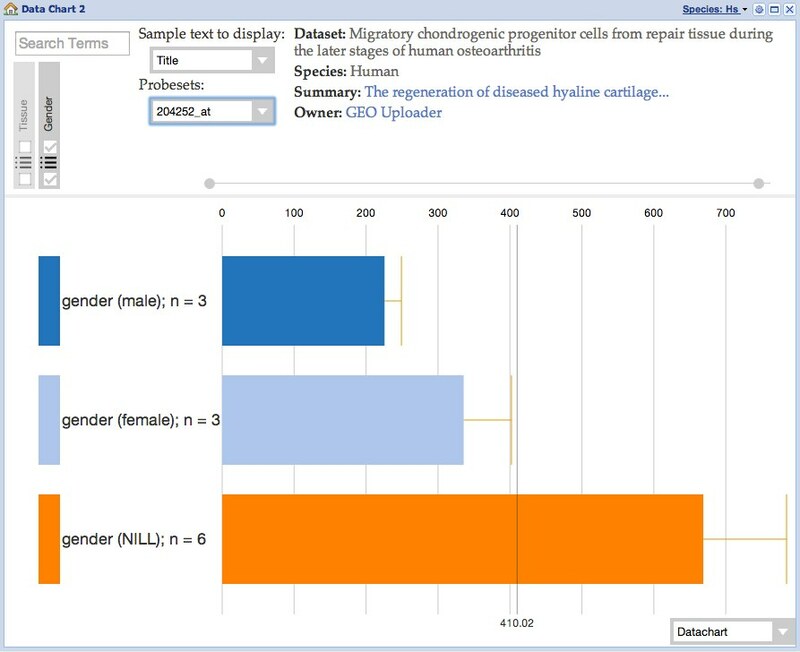 The hierarchical organization also visually shows us that a metastatic state is not available in our control sample for obvious reasons. From start to finish, it’s easy to explore the data contained within our datasets in a completely visual manner without any technical literacy. 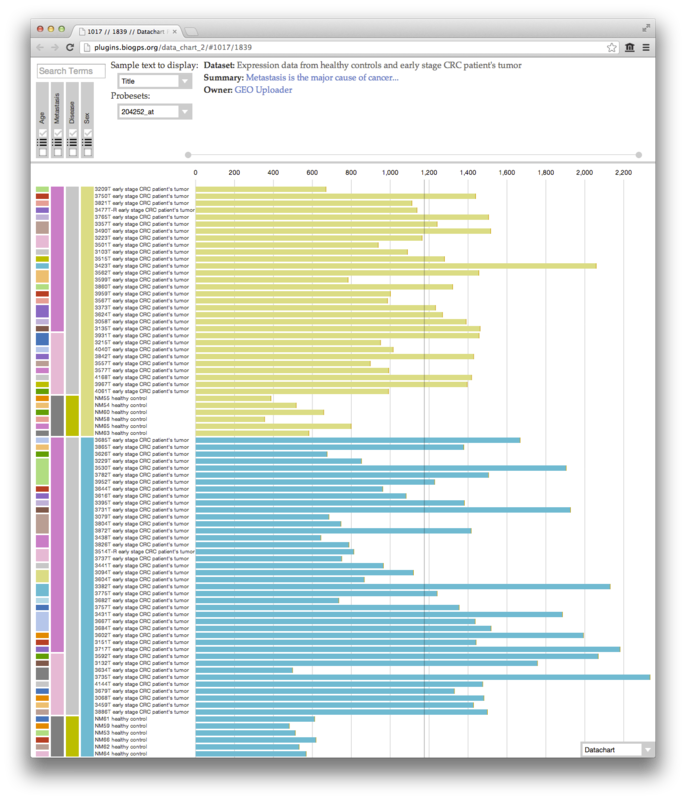 This plugin is just the first step in our efforts to expanding the visual beauty of intuitively exploring biological data. Sorting: Sometimes we want to rearrange all the different options for a given factor. Alphabetical, sequential, or to our own liking. The plugin lets you drag to rearrange the order of each factor option. Aggregating: Ever want to aggregate all the samples on a specific factor? The new plugin allows you to select a single or multiple factor type to aggregate on. This groups all of the samples that share the different factor options. This updates the standard error of the mean between the aggregated samples and then recalculate the mean value for all the different, newly aggregated sample bars. 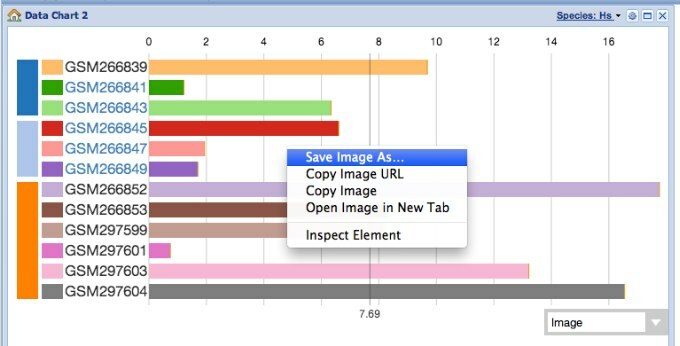 Search: Just as before, the new Data Chart plugin allows you to search across samples. 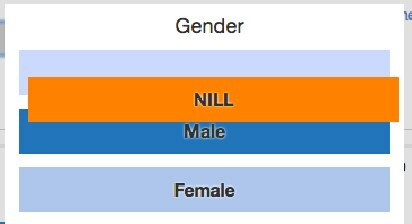 As you change the display text you want to show, the new chart updates the search to act on the currently displayed text. 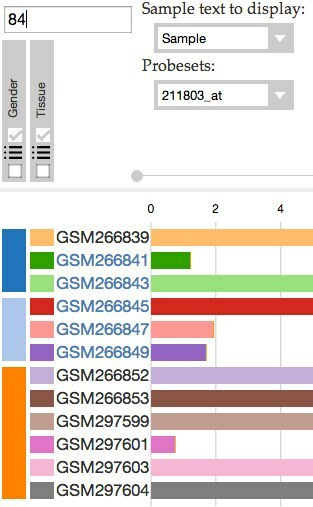 When samples move around, the search updates to stays smart about where your highlighted samples may have moved to. Saving: Often we’d like to revisit the plugin while retaining the dataset sorting or aggregating arrangement from when we were previously browsing. The new plugin keeps track of your display settings for a particular dataset. It will also keep track of your last viewed history so you will always be presented where you left off. Export as SVG: We love the current plugin’s capacity to save as an image. However, this returns a PNG image file which gives us no access to the different components of the chart. We wanted an easy way to rearrange labels, change colors, remove tick marks, and other small use cases which would make the web interface too complex. To get around this, we created a way to save out the currently viewed chart as a scalable vector graphic (SVG). SVG is a graphics standard which allows you to scale the chart up to as big as you’d like without any loss in resolution. To save out the file simply toggle the view type in the bottom right corner and then either right click and “Save As” or just drag into a destination folder on your computer. For those with common SVG editing programs like Adobe Illustrator you can load up the saved file, and will have access to all the different regions in the graphics. 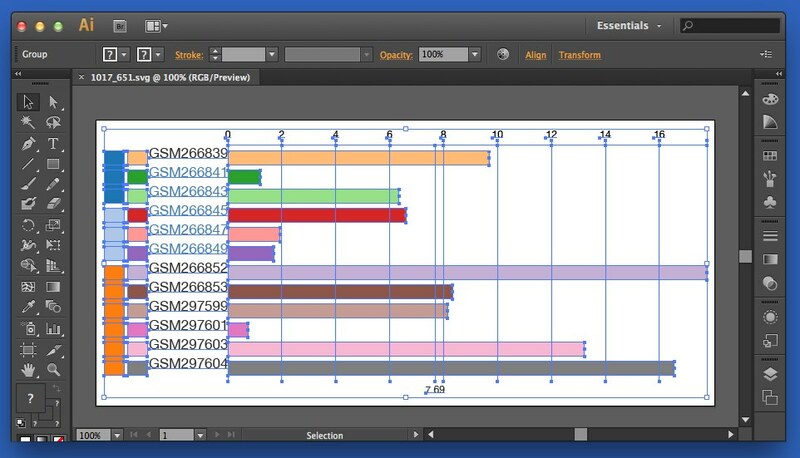 This allows you to delete regions, changes colors, add a watermark or any other modification you want without altering the quantitative scales of each sample bar or potentially adding pixelation. This feature gives you the full customization for post-processing the presentation of your dataset. 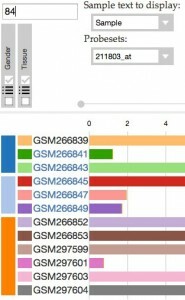 In addition to the listed features, the new plugin better handles data requests to BioGPS, has more informative tooltips, allows different sample label types, has a new dataset browser and many more features. Add it to your layout! There are many datasets on BioGPS that don’t have factors or other metadata and thus can’t use most of these improvements. However, we still think this update will be a big improvement as you’ll be able to treat a plain dataset just like you had before. This rewrite of the previous plugin more easily allow us to improve its performance, add features and fix any issues you might find in the future. Please please please send any requests, improvements, comments, or bug reports — you can submit them directly onto the Bitbucket issue tracker here, or contact us through the normal channels. We are releasing this as a beta exactly so we can get your feedback! This plugin is entirely open source and freely available on Bitbucket to remix, improve, and release back into the public! I would love to see this post reflected in a YouTube screencast. Would really help folks reproduce the analysis you did and more quickly understand how to use the tool.